"OMG I went to the grocery store today by myself! Adulting"
"Adulting is so hard, my mom makes me schedule my own appointments now!" "Haha, a bunch of kids needed an adult, so I went to look for a adult-er adult!" Sentences like these, or variations of them, are abound on social media. I have to admit, as someone on the cusp of adulthood (18 and off at college) I don't understand why people in their twenties are getting excited or patting themselves on the back for... surviving and doing what's necessary. Sorry not sorry, I don't think it's a big deal when you figure out how to do laundry on your own and start actually reading the papers you sign. Paying your own bills by the time you're 25 should be a given, not something you feel the need to get a gold star for! 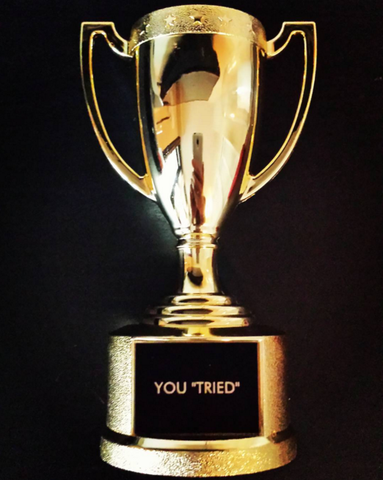 Put forth by millennials in their twenties, "adulting" seems to be the extension of the participation award. Oh, congratulations, you survived, you deserve a long day in bed for adulting so hard! You get a pat on the back just for showing up! No, I don't think so. We're living in a world today where no one wants to work for themselves, and the "adulting" mindset is a huge part of the problem. As a teacher once told my class, you don't get applause for doing just what you are expected to do (credits: Scottie too Hottie). Any 20-somethings reading this are probably asking what I know, I'm only 18, I don't do anything for myself. To that I would say, you're right! I'm still fairly dependent on my mom. But I'm also not tweeting about going to the grocery store by myself or crying because I filled out a tax form solo. Adulting is stupid, and I hope by the time I am doing a lot more things for myself, I'm a) not 27, and b) not expecting to get 30 retweets and accolades because I figured out how to do it! To further my concern, and hopefully yours, I learned fairly recently that this isn't just an annoying hashtag, it's a psychological phenomenon that's growing increasingly common: Emerging adulthood is the extension of childhood into the mid to late twenties. While my psychology teacher wouldn't come out and say it's a bad thing (probably because she was faced with a lecture hall full of 18-20somethings) it clearly... just is. What's good about having your parents pay your bill until 27 and asking for congratulations for going to work? 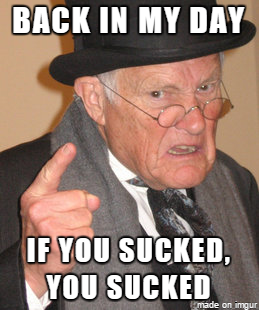 To anyone who considers themselves a victim of "adulting" or even if you just use it as a hashtag on Twitter, I'm now speaking directly to you. Please stop. You're embarrassing yourself, you're hurting how you come off to employers, you're getting on my nerves, and you're setting a bad standard. 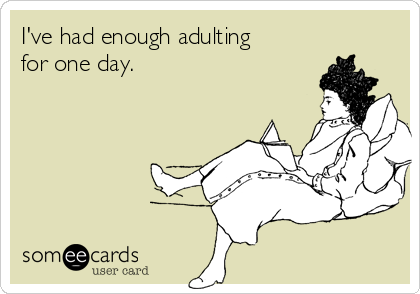 I give any of you full permission to tackle me if you see me crying or congratulating about "adulting." My advice if you really can't handle it? Own your adolescence or check yourself in to reality.